Well shut the front door. This Sabatasso’s gluten-free pizza from Costco is unbelievably good. When I lifted the first piece, the gooey cheese clung to the pie from which I pulled it, making that glorious stringy mess like a real, New York-style pizza fresh out of a brick oven. And the taste? Honestly – it tastes just like those awesome glutinous, mondo slices you get at the Costco food bar. There’s a lot of cheese on this pizza. 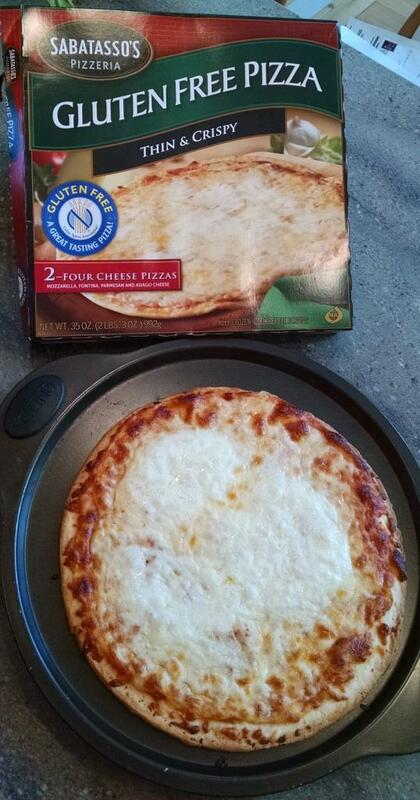 It’s very filling – so the fact they state 4 servings per pizza is, in fact, accurate. That’s two slices of rich, cheesy pizza. Wow. Not sure this can get any better? Well, it does. You get not one, but TWO! of these awesome pizzas for around $11. But wait, there’s more. You’re supposed to cook these pizzas directly on your oven’s rack. I hate cleaning my oven, my short little T-Rex arms can’t get in there – shut up, so I didn’t want to take the risk of cheese spillage (although I know it makes for a better crust). So I preheated the pizza pan in the oven and slid the pizza onto that (like Freschetta recommends). The very center of the crust wasn’t as crisp as it could have been, but it still came out excellent, didn’t stick to the pan, and didn’t make a mess in my oven. Bonus! If you don’t have a Costco membership, get a friend to pick some of these pizzas up for you. I guarantee you won’t be disappointed. And a special thanks to my pal DV Berkom for turning me onto these pizzas! Yep, they’re ever so yummy 🙂 Glad you found some! Oh yeah, they are awesome! I have had to be disciplined and not buy any otherwise I would eat them ALL!